When I was on this shaky dock, getting ready to dive in the Hudson with Thomas I was very optimistic, maybe even a little cocky. 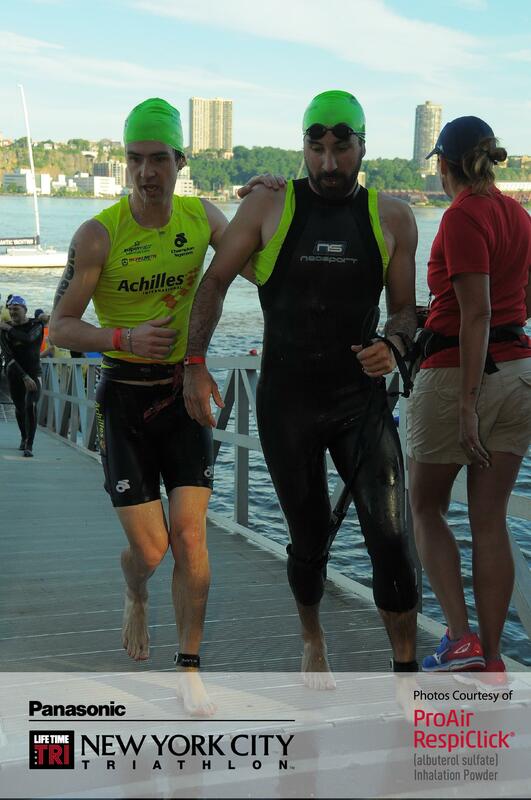 I prepared all winter for this race, I felt much stronger than last year, especially in the water and on the bike. 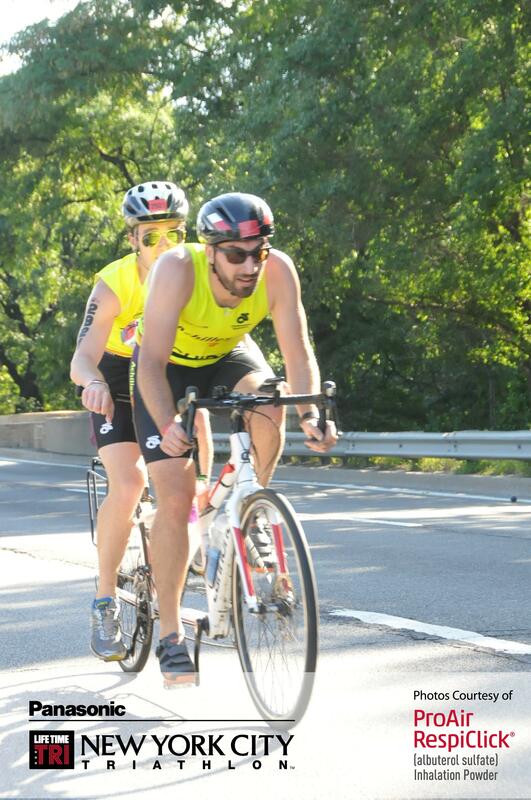 But the New York City Triathlon was about to teach me a good lesson. After five hundred meters in the Hudson, I’m in first place, I’m ecstatic! But suddenly my wetsuit feels too tight, I can’t breathe. I stop for a second, Thomas has no idea that I’m going through a terrible anxiety attack. I want to give up. It’s not the first time that this happens to me, I know that I have to force myself to breathe out as much as possible. I feel a little better, I swim again, slowly. I can hear my main competitors passing me one by one, I feel like an idiot. I count my strokes, I get back in the rhythm, but I can’t wait to get out of the water. We finally arrive to the dock, we rush out of there, my heartrate goes up, I’m ready for 26 miles on the bike! I grab my bottle of Perpetuem, it touches my pedal, I drop it on the road. This is not my day! But let’s not forget that my Russian competitor is slightly ahead of me, Thomas and I get to work. We average a good 22 miles per hour, we pass a lot of people, quickly we are in first place again. But of course, this couldn’t last. On a big incline, our chain pops, we have to stop. Thomas is very pissed off, he curses in French. I feel useless, I wish I could help and do more than just hold the bike. There are two chains on a tandem, it can be tricky to fix this quickly. But Thomas knows his stuff, in less than two minutes we are back on the road. The rest of the bike is wonderful, it’s a fun course, we even reach 40 miles per hour at some point! Just before transition we catch the leader, we are next to each other while we rack our bikes. Our transition is a bit of a mess, Thomas struggles with his shoes, I put on his hat, he wears mine, we lose about a minute, and yet again, we have to run after the leader. I joke about it, Thomas isn’t amused. I feel confident on the run, I decide to really go for it. We quickly get to first place, now we have to hold this pace, another race begins, a race against the clock, a race against myself. The heat is killing me, I drink as much as possible, I even put ice cubes in my shorts to cool down my body. I slow down slightly, the hills of Central Park are unforgiving. But I keep telling to myself that if it’s hurting me, it’s hurting everyone else as well. That’s when wearing an Achilles jersey is a huge plus. The crowd goes crazy for us! I know, I get a little feisty when I’m hurting. Thomas was very gracious and carried my bottle until the end. I manage to hold a 7:30 pace in the last few miles, we finished strong, what a pleasant feeling! I learned a lot during this race, it was a wonderful experience. We finished in 2:31, a new PR for me, first in our category, 733rd out of 3,320. My next triathlon will be the national championship in Santa Cruz on August 14! 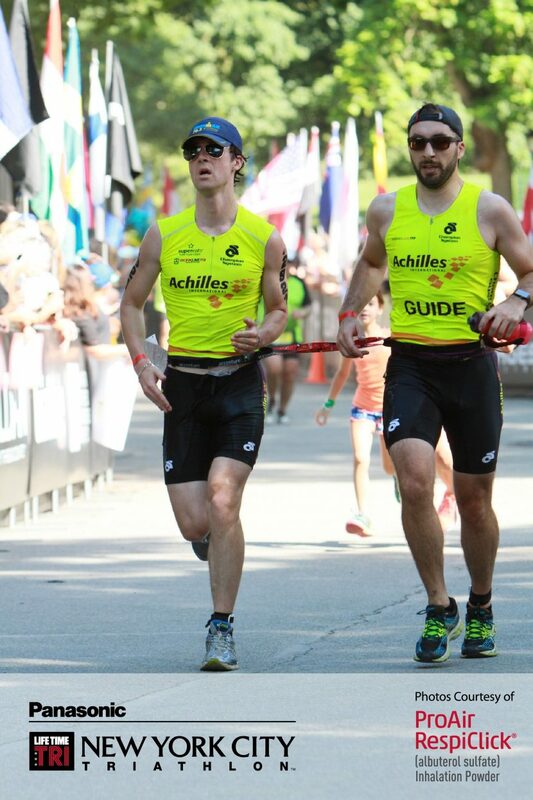 Keep going and good luck for the half iron!